Shakespeare has a rich and varied performance tradition in Japan, stretching from the Westernising and modernising ferment of the nineteenth-century Meiji era to the postmodern performance culture. How has the tradition evolved? Where is it going? How is it to be accounted for in theatrical and cultural terms? What does it mean to perform Shakespeare in Japan? This book pursues such questions in fourteen essays on key aspects, moments and personalities in the performance tradition. These are followed by provocative interviews with four of Japan’s leading directors (Deguchi Norio, Ninagawa Yukio, Suzuki Tadashi and Noda Hideki) and with one leading performer (Hira Mikijiro). 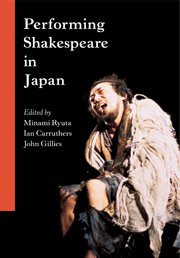 This explores the interaction of Japanese and Western conceptions of Shakespeare, and the assimilation of Shakespeare into Japan’s richly traditional theatre practice. 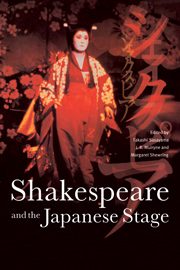 The first part deals with key twentieth-century moments in the production of Shakespeare, including the work of world-famous Japanese directors such as Ninagawa, Suzuki and Noda, while the second part considers parallels and differences between Japanese and western theatre over a longer time span, focusing on the relationship of Shakespeare to traditional Japanese Noh, Kabuki, Bunraku and Kyogen. Details: both titles are published by Cambridge University Press in paperback, priced in local currencies. Asian Books Blog is scarcely original in running a Shakespeare week, and Goodreads is a much bigger and more influential outfit with the same idea. They asked famous authors to write scenes supposedly deleted from the plays, including, e.g., Margaret Atwood who wrote a scene deleted from The Tempest - her upcoming novel Hag-Seed will re-imagine the play. Inspired by Goodreads, I'm inviting readers of Asian Books Blog to imagine postcards home, from Shakespearean characters suddenly teleported and time-transported to modern Asia. If I get any responses, I'll post them on Sunday. Hamlet sending a postcard to Mum, from Beijing? Romeo writing to Juliet from Bangkok? Lady Macbeth writing to hubby, following a shopping spree in Hong Kong....??? ?